Endometrioid carcinoma, generally categorized as type I carcinoma, is the most common type of endometrial carcinoma, accounting for approx 80-85% of all cases. Consequently, it has been more extensively studied at the molecular level than the other histological types. A wide variety of cancer-related genes have been analyzed in this tumor type, but only the most commonly altered genes will be discussed in this chapter. The tumor suppressor gene, PTEN is mutated in a wide variety of human tumors and is the most frequently altered gene in endometrioid carcinoma. In fact, endometrioid carcinoma has the highest frequency of intragenic PTEN mutations compared with any other single tumor type. PTEN is located on chromosome 10q23.3, a region of the genome that undergoes loss of heterozygosity in approx 20-30% of endometrioid carcinomas and 30-80% of tumors having intragenic mutation (1). In addition, mutations have been detected in approx 20% of hyperplastic lesions, both with and without atypia, suggesting that mutations in PTEN occur relatively early in the pathogenesis of endometrioid carcinoma (2,3). This is in contrast to other tumor types (e.g., prostate cancer, melanoma, and gliomas), in which PTEN is believed to be inactivated later in their development. Initially, based on sequence homology, it was believed that PTEN encoded a dual specificity protein phosphatase. It was later shown that in vitro it had lipid phosphatase activity (4). Presently, its most well-documented substrate is the lipid molecule phosphatidylinositol 3,4,5-triphosphate. This lipid molecule is an important second messenger that regulates the phosphorylation of a protein called AKT (also known as protein kinase-B). The downstream targets of phosphorylated AKT include a number of molecules that directly affect cell-cycle regulation (e.g., p21WAF1/CIP1, p27KIP1) and apoptosis (e.g., BAD, MDM2, FKHR). Thus, loss of PTEN function results in the ability of cells to both proliferate and escape cellular senescence. In in vitro studies the introduction of PTEN into tumor cells that lacks its expression results in either cell-cycle arrest or apoptosis depending on the cell type and the amount of exogenously expressed PTEN. In endometrial carcinoma cell lines both apoptosis and cell-cycle arrest have been induced by the introduction of wild-type PTEN into cells with altered PTEN. In the study that demonstrated apoptosis, PTEN was introduced using adenovirus-mediated gene transfer, which resulted in marked overexpression of the protein (5). In the study, in which PTEN induced a G1 cell-cycle arrest, a retroviral approach was used, which generated more physiological levels of PTEN expression (6). In cell lines with altered PTEN, there were increased levels of phosphorylated AKT that decreased with introduction of wild-type PTEN and the growth of cells containing wild-type PTEN was unaffected by exogenous PTEN expression. In the latter studies, growth arrest required a functional phosphatase domain. Total levels of CIP/KIP and INK4 family members, the known inhibitory regulators of the G1 phase of the cell cycle, were unchanged. However, PTEN induced a specific reduction of cyclin D3 levels, and an associated increase in the amount of the inhibitor p27KIP1 complexed with CDK2 (6). These studies suggest that in the endometrium loss of PTEN might contribute to both loss of cell-cycle regulation and avoidance of cell death. 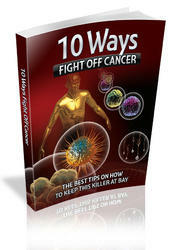 In other tumor systems PTEN has resulted in increased levels of p27KIP1. The significance of this finding in the endometrial cancer cell lines is unclear as immunohistochemical studies have suggested that endometrial carcinomas often show an increase in cyclin D1 expression (7). There is a wide spectrum of mutations (missense, nonsense, and frameshift) of PTEN in endometrioid carcinoma, which primarily occur in exons 3-5, 7, and 8 targeting not only the phosphatase domain, but also regions that control protein stability, phophatase activity, and localization (1,8). Many of the mutations result in decreased expression of PTEN documented by both Western blot analysis and immunohistochemistry. Furthermore, one study has found loss of PTEN expression in clusters of endometrial glands that appear morphologically benign, suggesting that PTEN alteration may precede the development of detectable light microscopic lesions (9). In addition, some data have suggested that epigenetic mechanisms (e.g., promoter hypermethylation) and subcellular localization can affect PTEN function in the absence of intragenic mutations. However, neither the in vitro studies nor the mutational analysis have elucidated the mechanism by which loss of PTEN contributes to the early development of endometrial carcinoma. Interestingly, as discussed later, intragenic mutations in PTEN are associated with microsatellite instability (MSI), another common early molecular alteration found in endometrioid carcinomas (1,10). Although, the association is believed to be important, the mechanism(s) underlying it and its consequences remain unclear. MSI is defined as alterations in the length of short, repetitive DNA sequences. The instability of the repeats is a direct consequence of the lack of intact DNA mismatch repair, an essential system for correcting DNA sequence errors created during replication. In endometrioid carcinoma and other tumors, the DNA mismatch repair system is disabled either through intragenic mutation of one of the DNA mismatch repair genes or more commonly through promoter hypermethylation of the MLH1 gene (11,12). The absence of DNA mismatch repair results in an increase in the rate of mutation in other cancer-causing genes, thus accelerating tumorigenesis. MSI is detected in approx 20% of sporadic endometrial cancers and can be found in complex atypical hyperplasias that are associated with cancers that demonstrate instability (2). However, it has not, been found in lesser degrees of hyperplasia, although methylation of the hMLHl promoter has been detected in hyperplasia without atypia (13). MSI is also found in endometrial carcinomas arising in patients affected by hereditary nonpolyposis colorectal carcinoma, a family cancer syndrome, in which endome-trial carcinoma is the most common noncolorectal malignancy. Although, it remains unclear exactly when in the development of endometrial neoplasia the DNA mismatch repair system becomes inactivated, the presence of MSI in hyperplastic lesions and the high incidence of endometrial carcinoma in Hereditary nonpolyposis colorectal carcinoma families suggest that it may occur early in its pathogenesis. Additional studies are necessary to address the exact mechanisms and timing of DNA mismatch repair inacti-vation in the development of endometrioid carcinoma. Answers to this question are not only of biological interest, but may also have important clinical ramifications. The TP53 tumor suppressor gene has received considerable attention in endometrial cancer. Mutations in TP53 are found in approx 10-20% of all endometrioid carcinomas, the majority occurring in high-grade tumors. 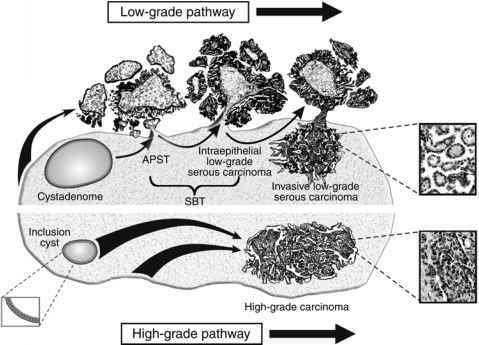 Approximately 50% of Grade 3 tumors and rare Grade 2 tumors, contain TP53 mutations, but they have not been identified in Grade 1 tumors or endometrial hyperplasia (14). Furthermore, a number of studies have shown that both p53 overexpression and mutation are associated with a poor prognosis (15). It is of interest to note that Bohkman classified Grade 3 endometri-oid carcinomas as type II tumors in the original study. Molecular data now exist, which suggest that most Grade 2 and some Grade 3 tumors have molecular profiles similar to Grade 1 tumors (e.g., PTEN and K-ras mutations, and MSI) (14). In addition, a number of oncogenes (e.g., c-myc, HER-2/neu, bcl-2, and c-fms) have been studied in endometrial carcinomas, but only a few are altered in a significant number of cases. One of the most commonly altered is the KRAS protooncogene. KRAS encodes a guanine nucleotide binding protein of 21 kDa, which has a central role in the regulation of cell growth and differentiation by transducing signals from activated transmembrane receptors. Mutations in KRAS result in constitutive activity even in the absence of an activated receptor and, in several studies have been identified consistently in 10-30% of endometrial cancers (14). The mutations have been found in all grades of endometrioid carcinoma and have been reported in complex atypical hyperplasia, suggesting a relatively early role for KRAS mutations in this tumor type. Most recently, mutations in the CTNNB1 gene have been found in approx 15-20% of endometrioid carcinomas with an accumulation of the protein found in 38% of cases (16,17). This suggests a role for the Wnt signal transduction pathway, a pathway commonly altered in colorectal carcinoma. Interestingly, aberrations have recently been described in this pathway in endometrioid tumors of the ovary. Additional studies will be needed to determine the significance of this pathway in endometrioid carcinomas of the uterus.